Did you know that cats can suffer from achy and stiff joints just like people and dogs do? Cat Hip Action treats contain cat-specific levels of the same pharmaceutical-grade glucosamine and chondroitin found in our best-selling Hip Action dog treats. In addition to soothing aches and pains, recent studies show that glucosamine also can promote cat urinary tract health. 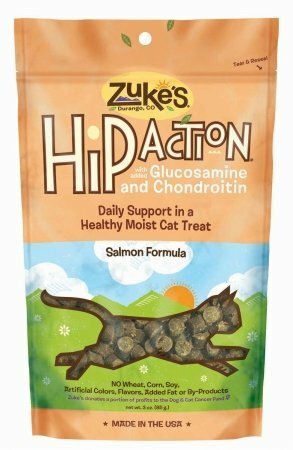 Made with real chicken and salmon, plus vitamins and minerals, Hip Action treats are a delicious way to keep your cat agile and healthy. HIGHEST QUALITY LATEST 2016 RELEASE - UNIVERSAL BIKE PHONE MOUNT Designed to fit all SmartPhones and devices up to 3.7" in width as well as motorcycle and bicycle handlebars of 0.9" to 1.3" diameter. Can hold iPhone X 8 8+ 7 7+ 6s 6s+ 6 6+ 5se 5s 5 4s 4, Samsung Galaxy S9 S8 S 8+ S7 S6 S5 S4 S3, Note 1 2 3 4 5 8, LG G5 G4, HTC, Nokia, Nexus, Sony, Blackberry, Motorola, GPS Holder (Garmin), Go Pro and More.THE CLAMP'S AUTOMATIC ADJUSTMENT SYSTEM GRIPS ANY DEVICE PERFECTLY. Unlike the low quality phone mount for bikes products that have set settings only and can clamp your phone loosely or even worse - fail to clamp it properly at all. MONGOORA's bike phone holder can fit with the handle bars of up to 1.3 in diameter, so if your bars are like 99% of others - you will have no problems!TOP LEVEL SECURITY For the most extreme users of our bicycle phone mount, we've equipped it with 3 special durable silicone bands that provide extra protection of the device. With this extra protection - your device is 100% secure against accidental loss. Our holder was rigorously tested in both road and trail riding and has never once dropped the phone - no matter how hard we pushed it.THREE COLORS AND EXTRA STRONG AND ELASTIC SILICONE BANDS - Mongoora cell phone bike mount comes with 3 silicone butterfly bands so you can choose colors and have backup bands if you need them. BEWARE of low quality common rubber bands.SIMPLE 2 MINUTE INSTALLATION (All tools included) There's nothing worse than a complicated installation! Thankfully, MONGOORA bike phone mount's installation is easy, and takes only up to 2 minutes to get everything you need set up.LIFETIME WARRANTY: 100% NO HASSLE MONEY-BACK GUARANTEE - We firmly believe in the quality of our product. And we back this up by giving you a 100% no questions asked money back guarantee, if you are not fully satisfied with our product.